Product review: Something different – by anon, 11 Jul 15 4/5 Good "The date was arranged for me so I am unable to comment how easy it was. The facilities were fine and it was not difficult to find the venue. Staff were generally helpful and polite although one instructor was a bit abrupt (he is not in the airforce anymore). The safety briefing was both informative and clear. It was a good experience and worth doing but not sure I would pay for it myself. Unfortunately no photographs were taken. It would have been nice to have them take some to send on via email. " 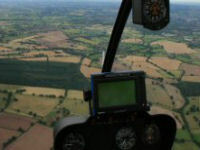 An opportunity to fly at the controls of the world's most popular helicopter with an experienced instructor. Very easy to get to the venue. Good facilities for visitors. Staff were friendly and helpful. The Briefing was short but enough to understand the safety elements. [the experience itself] Fantastic , just a shame it went so fast.I guess I could have taken photographs however I didn't try to. The date was arranged for me so I am unable to comment how easy it was. The facilities were fine and it was not difficult to find the venue. Staff were generally helpful and polite although one instructor was a bit abrupt (he is not in the airforce anymore). The safety briefing was both informative and clear. It was a good experience and worth doing but not sure I would pay for it myself. Unfortunately no photographs were taken. It would have been nice to have them take some to send on via email. It was very easy to arrange the date. The people on the phone were very helpful and accomodating. The venue was very easy to find with Satnav! All the people at the airfield were very friendly and helpful. The equipment was all very well looked after - they made a point of telling us about the maintenance program. During the briefing I felt very looked after. The information was clear and to the point. Safety was obviously, and quite rightly , a priority. The experience itself was very enjoyable. Flying a helicopter appears to involve all arms and legs at once!.I have a new appreciation of helicopter pilots. Unfortunately we did not get any photographs as we forgot our camera. Perhaps the site could sell disposables. [booking was] very easy...very helpful and accommodating...We found the venue easily with the sat nav...the equipment was all very well looked after...Safety was clearly and quite rightly a priority. Very enjoyable - flying a helicopter seems to involve all arms and legs at once! I have a new apppreciation of helicopter pilots. We forgot our camera! Suggest the site sells disposables!